The inquiry will examine the barriers which are preventing more people from cycling in the UK. Cycling makes up 2% of all journeys in the UK, compared to 27% in the Netherlands and 18% in Denmark. Some European towns have more than 50% of all journeys made by bike. We will be taking written evidence from stakeholders on issues including road safety, training, enforcement, planning and design, theft and highway maintenance . There will be six evidence sessions starting in mid January and a panel of MPs and Peers will take verbal evidence from a selected group of witnesses. A report with recommendations will be written by Professor Phil Goodwin and will be published in mid-April. Please see terms of reference for the inquiry in the post below. We are looking for written submissions which will answer the question “How can we get Britain cycling?”. The deadline for submissions is Wednesday 5th December 2012 and should be sent via e-mail to Adam Coffman (coffmana@parliament.uk). Submissions should be brief and any submissions of more than six pages long should include a table of contents. The deadline for the receipt of written evidence is Friday 7th December 2012. 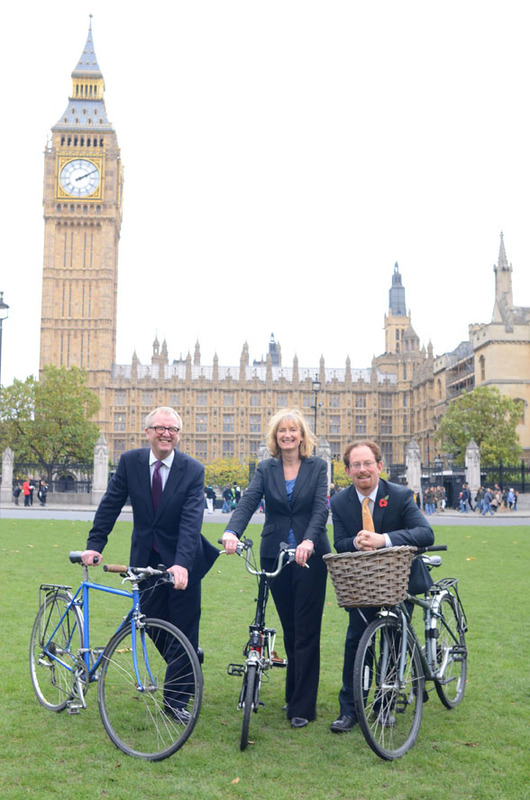 L-R: Ian Austin MP (co-chair), Dr. Sarah Wollaston MP (treasurer), Julian Huppert MP (co-chair). 1. Aims: to enable more people across the UK to take up cycling, cycle more often and cycle more safely by interviewing or receiving written evidence from expert witnesses on the obstacles that must be overcome and suggesting concrete, effective measures to be undertaken by central and local government as well as the wider world of business and the third sector. 2. Title: ‘Get Britain Cycling’ has been suggested to emphasise that the investigation is focused on helping everyone use a bicycle (more often): from long-term, long-distance enthusiasts to those who have never ridden being able to cycle as part of their daily routine and ensuring that all levels of government and other partners focus on achieving an ambitious increase in cycling across the UK. 3. Format: a select committee style inquiry, made up of a cross-party group of Parliamentarians, looking at a comprehensive range of issues affecting the numbers of people cycling in the UK, producing a report based on the written and oral evidence received. 4. Membership: we would want to have at least half a dozen present for each session, but all members may not be able to attend all of them, so we should identify ten members willing to take part. 7. Resources: external sponsorship will cover the cost of administration to co-ordinate the sessions , the writing, and launch of the report. 8. Staffing: sponsorship will also pay for an external author for the report, someone with knowledge of parliamentary procedure, experience of similar inquiries and understanding of how to ensure the inquiry translates into political change. a. An authoritative, considered document which combines expert advice to create specific policy proposals which the APPCG and UKCA can seek to influence government. c. A statement setting out a clear ambition to deliver more and safer cycling, as part of a wider vision for healthy and sustainable communities and vibrant economies signed by the Secretary of State for Transport and the Prime Minister. a. Cross-party and cross-organisational support for the enquiries recommendations. b. Renewed parliamentary and governmental attention on cycling. c. Renewed media focus on cycling and relevant policy. d. Capitalisation on the focus on cycling owing to the Olympics and Paralympics. • Dangerous roads & junctions – including cycle routes, priority lights.